New stylish and Elegant Stripe design, gives a whole new look to your car. Highly Durable and Long Lasting material protects your vehicle against wet, humid and dusty climatic conditions. High-Quality fabric naturally resists moisture, fungus and expels stale odor. High Quality imported threads used to stitch the cover tight and securely. Keeps your vehicle cooler, dry and dust free. It remains unaffected by adverse climatic conditions. Machine washable, Foldable Material, Double Stitched. Perfect fitting for the mentioned car model. 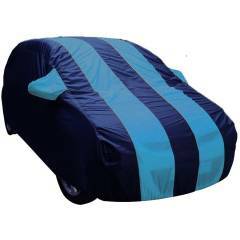 AutoLane Aqua Blue Matty Car Cover with Buckle Belt for Maruti Suzuki Wagon R New is a premium quality Car Covers from Autolane. Moglix is a well-known ecommerce platform for qualitative range of Car Covers. All AutoLane Aqua Blue Matty Car Cover with Buckle Belt for Maruti Suzuki Wagon R New are manufactured by using quality assured material and advanced techniques, which make them up to the standard in this highly challenging field. The materials utilized to manufacture AutoLane Aqua Blue Matty Car Cover with Buckle Belt for Maruti Suzuki Wagon R New, are sourced from the most reliable and official Car Covers vendors, chosen after performing detailed market surveys. Thus, Autolane products are widely acknowledged in the market for their high quality. We are dedicatedly involved in providing an excellent quality array of Autolane Car Covers.